Once you’ve picked out the perfect outdoor table, chairs and barstools, placed a few key accessories, and have an outdoor space you’re proud of, adding a flagstone pathway that leads to, away, or through it will enhance the area and add that finishing touch. Picture relaxing on your patio or deck and overlooking a stone path you’ve created as it meanders through your landscaping choices. 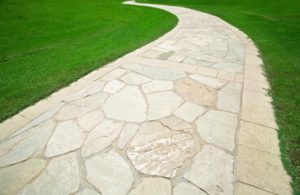 Here we’ve outlined exactly what you need to do to lay a flagstone pathway yourself, a perfect weekend DIY project. First you’ll want to start by collecting all of the materials and tools you will need to get the project started. Trust me, it puts a real damper on the headway you are making if you have to stop part way into the project and run back out to your local home improvement store! Now you’re ready to dig in and get your flagstone pathway started! First, prepare your area by digging up about 4 inches of soil in the area where you want to lay your flagstones. Then rake the area smooth and remove any rocks and debris underneath. If you line your intended pathway with the plastic edging, it will give you a clear idea of what the path will look like. Next, lay a small layer of gravel where you just removed the soil. This will help to prevent any weeds from popping up. Then pour a 2-inch layer of sand over the gravel and rake it smooth. Lightly mist the sand with water and flatten using a compacter. Next, create your flagstone pathway. Lay each stone piece, and work it carefully into position ensuring that each piece is level. Setting the stones four to five inches apart is a good average, but you can place them as close to each other as you want. The gaps between the flagstones can be filled with a variety of materials including sand, gravel, pebbles or mulch. Then use a broom to sweep excess mulch or other filler material off of the stones. The last step is the best. This is the part where you can stand back and appreciate the time and effort you put into creating a unique pathway that will accentuate your outdoor space.